The entire pie is rotten. Click here to download readable PDF version. Click here to see detail of image. On 19 January 2004, Lieutenant General (LTG) Ricardo S. Sanchez, Commander, Combined Joint Task Force Seven (CJTF-7) requested that the Commander, US Central Command, appoint an Investigating Officer (IO) in the grade of Major General (MG) or above to investigate the conduct of operations within the 800th Military Police (MP) Brigade. 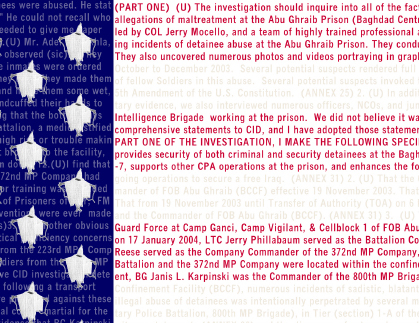 LTG Sanchez requested an investigation of detention and internment operations by the Brigade from 1 November 2003 to present. LTG Sanchez cited recent reports of detainee abuse, escapes from confinement facilities, and accountability lapses, which indicated systemic problems within the brigade and suggested a lack of clear standards, proficiency, and leadership. LTG Sanchez requested a comprehensive and all-encompassing inquiry to make findings and recommendations concerning the fitness and performance of the 800th MP Brigade. When Secretary of Defense, Donald Rumsfeld testified before the Senate Armed Services Committee that the majority of servicemembers were decent human beings and that the perpetrators of the abuse at Abu Ghraib (and the ever-widening perimeter of detention facilities in Iraq and Afghanistan) were merely “bad apples,” he may have been correct, although he failed to look into the mirror to identify the source of the rot. So a bunch of photographs depicting violent and sadistic physical abuse and torture at Saddam Hussein’s notorious Abu Ghraib prison emerge, and suddenly America and the rest of the cowardly allied world and equally vile Middle East are horrified. The frighteningly detailed and vividly graphic Taguba Report, authored by the son of a survivor of a Japanese prison camp, Maj. Gen. Antonio M. Taguba, which revealed systemic abuse in an investigation of the 800th military Police Brigade, was not enough to get the top brass at the Pentagon interested enough to notify Congress or the President. Mr. Rumsfeld, the military brass and some of the lawmakers badly missed the point by talking endlessly about a few bad apples in one military unit. The despicable acts shown in those famous photos — and in videos that are being held back by the military but may still produce another round of global humiliation — were uniquely outrageous and inexcusable criminal acts. But behind them lies a detention system that treats all prisoners as terrorists regardless of their supposed offenses, and makes brutal interrogations all too common. This story was not given a high priority by anyone except the military, which was carrying out an internal investigation while proceeding with criminal charges, reprimands and suspensions. It wasn't until General Antonio Taguba's report of his investigation was seen by reporter Seymour Hersh, and the shocking photos were seen on CBS's Sixty Minutes II, that the story became a "scandal," and claims surfaced that Rumsfeld and the military had been orchestrating a cover-up. Clearly much of what went on in Abu Ghraib was wrong, stupid and counterproductive. The apologies from Bush and Rumsfeld reflect the higher standard to which America holds itself. Significantly, the Taguba report reveals that many of these detainees who were mistreated were among the worst prisoners. Some had started riots and attacked the guards with rocks and feces. While not justifying the brutality, it may help to understand it. Plus, it can't be forgotten that the prisoners were being interrogated so that information could be obtained which could save American soldiers' lives. It would be helpful if more reporters made this simple, basic and factual point. There are 135,000 American troops in Iraq trying to complete the successful liberation of Iraq. Why have the media forgotten about them?